On March 6, key city center across the country will reverberate the meaning of the “day of healing” through simultaneous rituals at daybreak to signify our quest for a fresh start for the conflict-affected communities. Azan, the first morning prayer among Muslims, will commence the interfaith prayers and at 6:00AM, the church bells will mark a solemn 1-minute “calls for peace” through gongs, bells, etc. -“every beat-second, every breah of a fallen”. This peace ritual will be repeated at 12:30PM during the “bang” or “call to prayer” of the Muslims for their Congressional Prayer. Peace vigils will be held in communities and selected areas on the evening of March 5 so that those in attendance will be able to collectively greet the dawn on March 6 with morning prayers and solemn “calls-for-peace”. 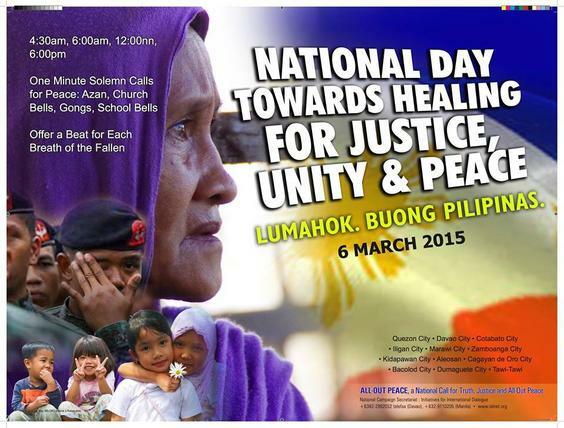 From Baguio to Mamasapano – in public places, communities, schools, offices, factories, farms – on March 6, the entire nation will deliver a message of peace. Area organizers are given freehand on how to develop the day’s program, as long as synchronized action is held at dawn and repeated during lunch. The whole day can be punctuated by advocacy activities: group interfaith or ecumenical prayers, reading of statements, TV guestings, radio hops, art-for-peace or peace fest, dialogu circles, sports-for-peace and peace walks. Anytime of the day, the public will be enjoined to sign a personal pledge, the “All out Peace Manifesto”. A Call for Humanitarian Ceasefire in MaguindaNOW!